OSWEGO — A water- and labor-conserving Smart Garden takes shape in a lab in SUNY Oswego’s Shineman Center, as three seniors in electrical and computer engineering prepare a presentation for the college’s Quest symposium April 3. SUNY Oswego seniors in electrical and computer engineering display components of the Smart Garden watering system they’re building for a capstone project. They will present preliminary results at the college’s Quest symposium on April 3. From left are Zachary Gathmann, holding an irrigation stand, flow meter and moisture-sensing system; and Samantha Carey and David Ng Lee, with wireless communication modules. The students’ pre-graduation capstone project, the gravity-fed prototype relies on programmable, wireless communication modules transmitting data — including how much water any individual plant needs — from sensors for temperature, humidity and soil moisture to flow-metered valves. The Smart Garden project is the basis of just one of hundreds of scholarly and creative student, faculty and staff talks, demonstrations and poster presentations planned for Quest, which runs all day April 3 in venues across campus. For the first time, Quest will kick off the evening before — from 5 to 7 p.m. April 2 — with a display of scholarly and informative posters at SUNY Oswego’s Syracuse campus, enabling both traditional and nontraditional students, such as those with jobs and families, to take part in the college’s signature celebration of scholarship and creativity. 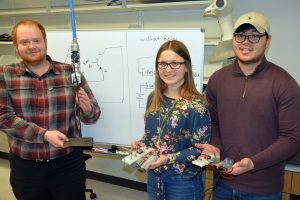 The Smart Garden project has meant long hours into nights for electrical and computer engineering (ECE) students Samantha Carey, Zachary Gathmann and David Ng Lee. Computerized watering systems are not a new idea — predecessors in the electrical and computer engineering program even presented a version of a Smart Garden at last year’s Quest — but Carey, Gathmann and Lee seek to improve on the design, making it simpler, more efficient and perhaps even scalable commercially. Gathmann, of Fabius, worked at a nursery in high school, and believes there’s potential for the team’s prototype. “If we could develop something that cuts labor costs significantly, maybe we could put this into real-world applications,” he said. The sensors are distributed to monitor individual plants — tomatoes, beans and so on — delivering precisely the right amount of water at the right time, thanks to communication modules programmed to take variable conditions into account, including the water demand of each variety of plant. It is a long way from giant rotating irrigation arms sweeping water across entire fields’ worth of plants. Carey switched her major to ECE after taking a careers and majors exploration course in her freshman residence, Johnson Hall, and after completing aptitude testing through SUNY Oswego’s student success center, the Compass. Lee said he enjoys the Shineman Center’s classroom setup for ECE courses, where students can face forward for lectures and discussions, then pivot their chairs to work with state-of-the-art equipment directly behind them. Gathmann transferred to SUNY Oswego after earning an associate’s degree in general studies. He gravitated to ECE because of his interest in tinkering with cars and other equipment, and because of a family interest — several aunts and uncles are engineers. “I have an interest in power systems, so I’ll look for power engineering jobs locally or power generation — I had an internship at Nine Mile Point last summer,” he said. A forthcoming Quest schedule and more information will be available via oswego.edu/quest, which also will include a link for downloading the Attendify mobile events app.